This excerpt from Henry Kelsey's journal (1690-91) is reprinted in the form used in the Dominion Archives Publication. If you have difficulty understanding what is said see a version printed in modern type. How many differences can you find? The natives language, and to see their land. Set from the house on the twelfth of June. Today we pitched at the outermost edge of the woods. This plain affords nothing but short grass and Buffalo and a great sort of bear which is bigger than any white bear, and is neither white nor black but silver haired like our English rabbit. The Buffalo likewise is not like those to the northward there. 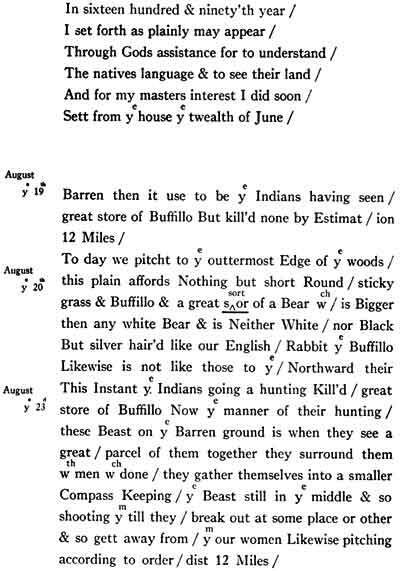 This instant (today) the Indians going a hunting killed a great store of buffalo. Now the manner of their hunting these beasts on the barren ground is (that) when they see a great parcel (number) of them together, they surround them with men, which done, they gather themselves into a smaller compass (circle), keeping the beasts still in the middle, and so shooting them till they break out at some place or other and so get away from them. Our women likewise pitching (camp) according to order. Distance 12 miles.